Face masks are my favorite part of the whole skincare routine. I love to use them as part of my evening pamper-routine or when I need to prepare my skin for important events. 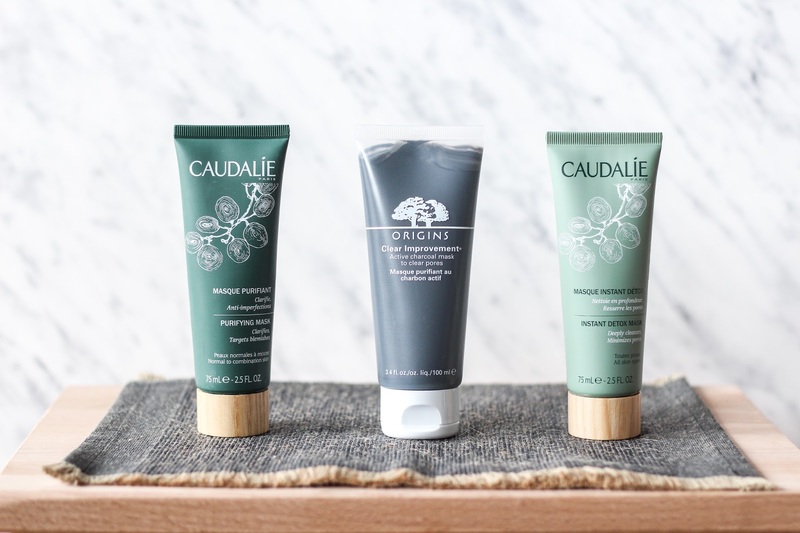 I've been mainly using Caudalie masks because of their amazing quality and great range of skincare products in general. Recently I've also added a new Origins mask to the mix, which I really enjoyed trying out. I've heard a lot of great things about the Origins skincare line and I surely wasn't disappointed. Because I have oily to combination skin, with some occasional blemishes, blackheads and enlarged pores, I look for and choose masks that target these specific areas. Here are my three favoruite masks that I like to use as part of my skincare routine - I like to switch them up, depending on the condition my skin is in. This is my newest face mask I've tried out and it has really changed my skin. As I've mentioned in my How to minimise enlarged pores? post, charcoal is a very effective ingredient for pores and blackheads or oily skin in general. I've noticed such a difference with my pores, because it really helped to minimise them. It's definitely a more heavy-duty mask in comparison to Caudalie's, so I usually use it when my skin needs a more thorough treatment. It's an excellent product, a really great mask to put on top of congested skin (blemishes and pores) and helps with the blackhead removal as well. The mask is very thick in consistency and when you put it on you get that tingling sensation (because it heats up), which I find rather refreshing. I usually leave the mask on for around 15 to 20 minutes to dry completely and then remove it with warm water or cloth. You have to be careful and gentle when removing it, because it clings to the skin so you have to rinse it well. The mask itself is quite drying so I would reccomend it for more oily skin types. But if you do have sensitive or dry skin and would still like to use it, try to apply only a thin layer all over the face. It's suggested to use it once a week or 2 weeks if you have sensitive skin, but you can definitely use it more often if you have oily to combination skin type like me. You have to adjust the usage to your skin-needs. The price is around 25 eur for 100ml (I bought it in Douglas), which is not the cheapest mask out there, but I honestly love to splurge a bit more on skincare products I know will work best for me. First thing to point out is of course the gorgeous packaging Caudalie offers in their skincare range. This mask is designed to unclog pores and remove all impurities, that's why I like to use it once or twice a week, especially when I have congested pores or when I feel my skin needs an extra radiance boost. It's a pink clay mask that draws out impurities, oils and tightens pores. The results are instant and amazing: my skin feels moisturised, cleaned, firm, radiant and overall clear. It's also very easy to apply and wash off - I leave it on for about 10-15 minutes and then wash it off with warm water. Again, this one is especially great for all of us with oily to combination skin type, but if you have more dry skin then I would recommend you to use it for a shorter period of time. This is the gentlest purifying mask I've ever tried out, so it's suitable for both oily and dry skin. It comes in a white paste and is supposed to be a gentler version of the Instant Detox Mask. I love to use it when my skin feels a bit dry, dehydrated and unbalanced. Sometimes even as a spot treatment. I apply it in the same way as all the aforementioned masks and rinse it off with warm water. My skin feels calmed, nourished, clearer and illuminated afterwards. I have already written an in-depth review about Caudalie Purifying Mask so click here for more details! This was really great to read! 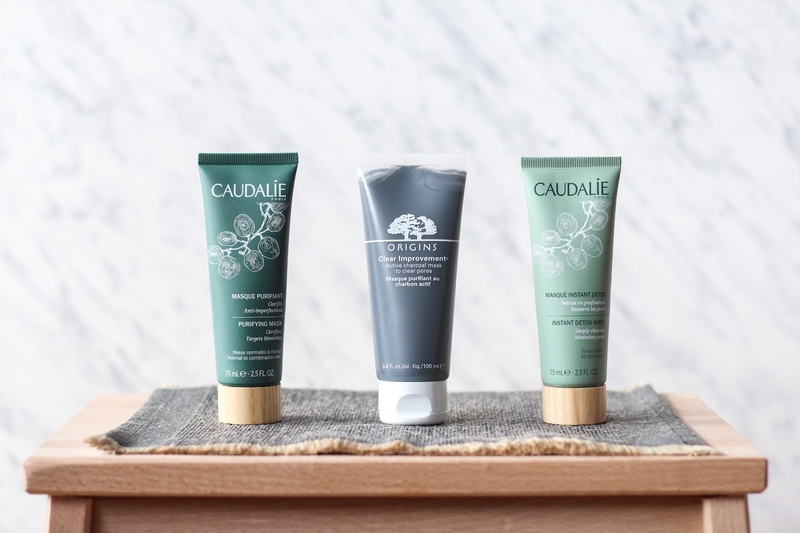 I love Caudalie but I've never thought to try their masks (for no good reason). I think I have to go try them especially since my skin gets a little strange during seasonal changes.